The English Springer Spaniel Rescue of Canada is the subject of our second interview. The President of ESRAC, Donna Toews, graciously accepted our request for an interview and I am very excited to post it here on Adopt-A-Pet-You-Will-Love. We have two pictures from Donna. Both dogs pictured have found their forever homes after spending time with English Springer Spaniel Rescue of Canada. The first, above right, shows the silly but dignified spirit of the breed. The second shows a before and after picture of a dog that needed care. 1. Donna, thank you for agreeing to this interview. Would you please tellus how you got involved with dog rescue? My family always looked to adoption as a way of acquiring an animal andour home was regularly blessed with a dog or cat who needed a new home. Igrew up helping animals in a variety of ways. In 1996 I was very fortunate to have a patient and knowledgeable mentorwho helped me start rescue in my area so that spaniels could get a secondchance. 2. Please tell us your current position with ESRAC and how long you havebeen involved. My formal title is President but all of our volunteers are equal inesteem. I was one of many volunteers who originally founded our federallyrecognized charity. 3. I see on the www.esracanada.org website that the rescue has beenoperating since late in 2004. Is there a count of how many English SpringerSpaniels have been rescued in that time? ESRAC started out with a bang in early 2005... 66 dogs were seized from abreeder in Atlantic Canada and we were called in to rehabilitate andrehome the dogs. There were two breeds involved and we worked with OldEnglish Sheepdog rescue in Northeastern US to place dogs as well as thespringers and the mixed offspring. All but one dog from the seizure foundtheir homes. Outside of the seizure, we've rehomed 68 springers. Much of our work alsoincludes education and helping owners keep their springers... we don'tkeep stats on those cases. 4. Are there volunteers all across Canada for ESRAC? We have volunteers in most provinces. We're very proud to have recentlypassed the 100 mark on our membership. 5. What is it about English Springer Spaniels that you love the most? Andhow would you describe their personality? I love their "joie de vivre"... many are comics who work to make humanslaugh; many are shadows who are constant companions; many act as bestfriends who lick away tears or listen to problems. English springer spaniels are for everyone but not all humans are rightfor springer spaniels. If you wish to share your life with an EnglishSpringer Spaniel please contact us or do some research about the breedfirst. Many people are not aware of the springer activity andintelligence. 6. Are there any common myths about rescues that you would like to commenton? For example, some people think that dogs are in rescues because theyare "bad dogs". When human lives change, it always affected their animals. Our fosterspringers are wonderful, friendly and devoted companions who, through nofault of their own, lost their homes. While we rarely have puppies in our foster program, most adoptorsappreciate a young dog who is already house-trained and has gone throughthe chewing stage. Springers are living to ages of 15-17 years now so evenan adult of 6 years of age is considered a young dog. One myth is that a dog won't bond with its owner if it's not a puppy.Springers bond quickly when they encounter kindness... and food! 7. What are the advantages to adopting an English Springer Spaniel from arescue? We tell all!! Everything we know about a foster dog is shared with apotential adoptor. We share written veterinary records showing any and allhealth concerns and vaccinations plus each foster dog has a writtenprofile that goes to the adoptor. The dogs are assessed for behaviour sowe can make the best match to a home. We support adoptors with trainingassistance and referrals. And we will ALWAYS take back one of our dogs. 8. thanks again for sharing your time with www.adopt-a-pet-you-will-love.com.Is there anything you would like to add? Potential adoptors may query our adoption protocol of interviews,reference checks, home visits and legal contracts, and think it's aninvasion on their privacy. All personal information is held in thestrictest confidence. This is a tried and true method in rehoming dogs sothat they find their permanent home. We have a very fair adoption fee soplease don't ask us to discount our dogs. Thanks to Donna from English Springer Spaniel Rescue of Canada. another great interview! I learned from it and hope you did too! Based on this interview, who would not want to rescue an English Springer Spaniel. Thanks Donna for your time. And thanks to the 100 plus volunteers with ESRAC who all give so much to save English Springer Spaniels in need. I know it is a labor of love! 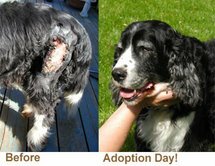 I encourage everyone reading this page to visit English Springer Spaniel Rescue of Canada (http://www.esracanada.org) and consider volunteering, donating, or adopting.